There are many special needs travel options, both to snow and sand vacation resorts, that offer fun for the whole family, including those with physical or mental disabilities or special dietary needs. In order to assist those interested in disability travel, we have compiled a list of destinations and travel resources that focus on leaving home with companions who have special needs, either physical or intellectual ones. From mainstream destinations with special programs for the deaf or mobility challenged, to specialty locations that focus primarily on working with autism and other mental disabilities, travelers of all backgrounds and interests should be able to find a fun family vacation. Tip: If you’re flying to your destination, this guide to how the airlines handle passengers with disabilities will be very useful. The Adaptive Snowsports program at Greek Peak ski resort. New England Disabled Sports at Loon Mountain offers year round recreation for disabled children and adults, with summer programs including water skiing, cycling, kayaking, hiking, and winter programs such as skiing, snowboarding, and telemarking for ages 4+. They employ over 160 volunteers who teach guests with both cognitive and physical disabilities. The New England Disabled Ski Team is for young, up-and-coming skiers and features elite-level skiers who have competed in Paralympics. A great program offered at this destination is PAC (Pre Adaptive Coach) Program. It is for teens ages 14-18 who want to become volunteer coaches. Loon Mountain added a 4,800-square-foot home for the program to the children’s center, which enables them to store more equipment and provide better access for participants. Our feature story on Loon Mountain has a complete list of activities and attractions on the destination. At Snowmass mountain in Aspen, the Challenge Aspen program is designed for those with physical and/or cognitive disabilities. They offer adaptive, recreational, and cultural activities year-round, with skiing and snowboarding in the winter, and hiking and fishing in the summer, along with kids’ camps and art programs. The summer activities include therapeutic art, drama, and outdoor adventure camps for kids. For the more advanced skiers, there is elite ski racing for adults with disabilities. The mountains’ Ascendigo program provides specially trained instructors to facilitate recreational learning for children and adults anywhere on the autism spectrum. Guests of any athletic ability can learn to ski or snowboard here in beautiful Aspen Snowmass. Snowmass also offers the Aspen Camp of the Deaf and Hard of Hearing which has provided activities for the deaf and hard of hearing for the past 50 years. Another unique initiative at Snowmass is the Rocky Mountain Adventures program for newly injured veterans. For more information regarding the Snowmass Aspen resort, read our article on Snowmass. At the all-inclusive FDR resort, families are provided with a personal vacation nanny, who will look after your kids, regardless of their needs, when parents want a break. These nannies are all trained and come highly recommended by our readers. The great thing about the vacation nannies is that they are exclusively yours for your entire stay, meaning they only work with your family. Family members with physical or intellectual challenges have an opportunity to get to know the nanny and feel comfortable with her. Whenever you don’t need her help, the nanny will stay back at your suite, do some housekeeping and restock your fridge. All of the air-conditioned suites are wheelchair accessible and numerous activities are offered that kids and adults of all abilities can partake in. Rooms come with a stocked kitchen, free internet access, a kitchen and dining area, and a balcony or terrace. Kids can participate in the Yellow Bird’s Kids Club daily from 7:30am to 10pm, where they have everything from arts’n’crafts and swimming to snorkeling and a video games room. 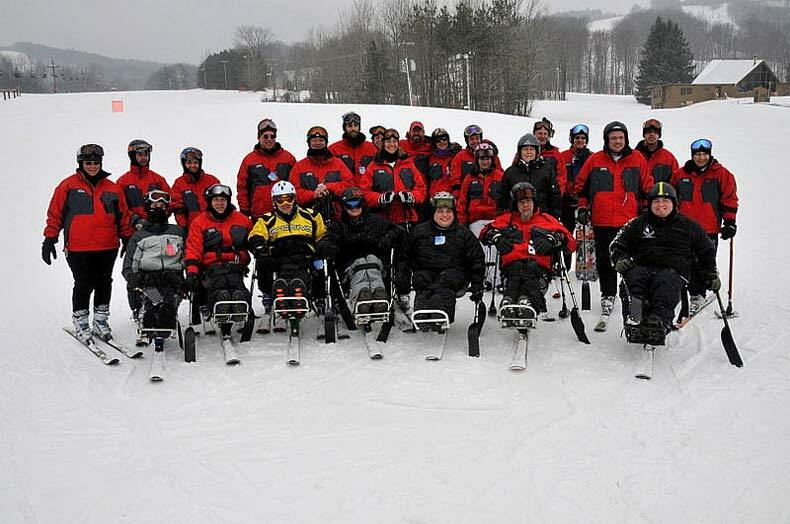 This comprehensive adaptive ski program takes place at a smaller ski resort in the Adirondacks region of New York, who founded GP Adaptive Snowports in 1974. They have a dedicated training center and support the volunteer organization that provides instruction, as well as offering reduced rate lift tickets on weekends for skiers and snowboarders with disabilities. Once each winter, the mountain hosts a Challenge for its guests with physical handicaps. Greek Peak has recently expanded with the Hope Lake Lodge and Indoor Waterpark, strengthening the family-friendly atmosphere and making it a fun mountain destination for families at any time of year. Based in Santa Cruz, California, this company organizes wheelchair accessible activities along with great adventures for people of all disabilities. With activities ranging from a day on the beach (they rent beach wheelchairs, a wonderful tool if you’ve never tried it) to a day in the sky, adaptive yoga, gardening, four-day kids’ summer camps and a multitude of arts and crafts events, Shared Adventures caters to all ages and abilities. In addition, they have sailing and kayaking excursions, a luau dance, indoor rock climbing, table tennis tournaments, and more. Since 1985, this company has been catering to the needs of wheelchair travelers, their friends and family. With services including vacation planning, group tours, group cruises, licensed travel companions, and travel resources, Accessible Journeys assists with your every need. Their 2018 departures included Amsterdam, Israel, Italy by Rail, Antarctica, India, Vietnam and Cambodia and a Luxury Egypt tour. They do the research so you don’t have to, planning wheelchair friendly vacations for everyone to enjoy. Reader Cheri Larson recently wrote to notify us of the comprehensive, practical special needs program guide on the PhD in Special Education site that includes her research on 101 websites dedicated to special needs activities, camps, summer programs and destinations. She adds, “I found great websites covering camps, music, dance, sports, special needs vacations, and other special needs info that anyone associated with the community would find useful.” Thank you Ms. Larson. Here are a few other resources. This handy website is part of IBCCES, a company that runs training and certification programs that help organizations better serve guests and clients with cognitive disorders, including autism, sensory disorders and other disabilities. Resorts, cultural facilities and attractions that have completed the IBCCES training from leading autism experts earn the “Certified Autism Center” designation and are promoted on this website. This company offers special physical needs rental equipment, ranging from wheelchairs and scooters to power chairs and oxygen tanks. Other offerings include hearing impaired equipment, Braille printing, and baby cribs. In addition you can get assistance with information regarding special needs travel. They are not a travel agency, but they can connect you with travel specialists who will book trips and rent the necessary equipment for your needs. This site is a great resource, providing travel news for wheelchair users and slow walkers. Users can ask questions about anything they might need help with regarding travel. The site also highlights destinations or resorts that focus on special needs travelers, providing you with direct access to what you’re looking for. The site is from special needs author Candy Harrington, who has written books such as 101 Places Accessible Vacations and Barrier-Free Travel. With insider tips on the most accessible travel options, this is a must-see. The United Spinal Association publishes many helpful resources online, inncluding tips on packing and how to give advance notice to the airlines about travelers with disabilities. This way, there are preparations made for seating arrangements, security and a wheelchair. The very helpful Traveling with a Disability guide is available online at the United Spinal Association’s website. In addition to these resources, most cruise companies and airlines have procedures and services for travelers’ with disabilities. In order to receive these services and ensure a completely accessible experience, ask your travel agent about these services and be sure to arrange for them ahead of time. For tips on how to make travel most convenient for you, follow our guide on Traveling With Special Needs Kids.